This luohan bed or couchbed, fashioned from huanghuali, displays the classic attributes of Ming furniture design: clear lines, perfect scale and elegant proportions. The craftsman has also satisfied his decorative impulses in a simple and restrained manner by carving both the front and back sides of the three solid railings with concave molding and raised beading, a feature rarely found on luohan beds. 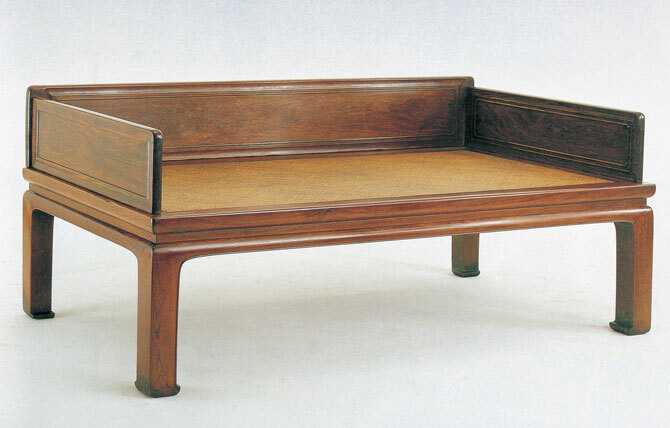 The construction and form of waisted furniture, its origins rooted in the Song dynasty, dictate that an inset panel, for structural and design purposes , be placed between the seat frame and convex apron, with the straight legs ending, as in theis case, in an early style of horse-hoof foot. The water erosion and decay under the bottom of the legs, along with its overall design, construction and style, suggest that this is an early piece with a dating from the middle to late Ming period.